Name Variation Margaretta R. Muller was also known as Gretta. Married Name 29 November 1944 As of 29 November 1944,her married name was Kieler. Margaretta R. Muller was born on 16 January 1927 at Tennyson, Grant, Wisconsin. Margaretta R. Muller married Francis E. Kieler, son of Lawrence Kieler and Mary Elizabeth Kunkel, on 29 November 1944. 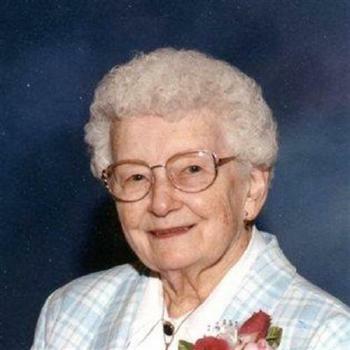 Margaretta R. Muller died on 30 March 2010 at age 83 KIELER , Wis. - Margaretta R. Kieler , 83, of Kieler , passed away Tuesday, March 30, 2010, at Mercy Medical Center-Dubuque. Services will be at 10:30 a.m. Tuesday, April 6, at Immaculate Conception Parish, Kieler , with the Rev. Bernie Rott officiating. Burial will be in the church cemetery. Friends may call from 3 to 8 p.m. Monday, April 5, at Immaculate Conception Parish Center, Kieler , and after 9:15 a.m. Tuesday at the parish. The Haudenshield Funeral Home & Cremation Services, Kieler , is in charge of arrangements. She was born on Jan. 16, 1927, in Tennyson, daughter of Phillip and Elizabeth (Holzer) Muller. She married Francis Kieler on Nov. 29, 1944, at Holy Ghost Catholic Church in Dickeyville. Margaretta and Francis farmed for a number of years until her husband started Kieler Feed & Seed in Kieler . She belonged to the Council of Catholic Women and Southwest Wisconsin CEW. She sang in the choir for many years at Immaculate Conception Church in Kieler . Surviving are her husband, Francis Kieler ; three daughters, Janet (Leo) Friederick, of Cassville, Joan (Gary) Studier, of Rockford, Ill., and Bonnie (Pete) Maring, of Kieler ; two sons, Gary (Peggy) Kieler and Frank Kieler , both of Cuba City; 12 grandchildren; 10 great-grandchildren; a brother, Clifford (Marie) Muller, of Lancaster; seven sisters, Edna Gillen, of Dickeyville, Marcella (Martin) Kieler , Marion Welter, Viola Richard, Betty Jansen, all of Kieler , Isabel (Robert) Dare and Patty (Joe) Kaster, both of Janesville; and a sister-in-law, Claudia Muller, of Kieler . She was preceded in death by her parents, Phillip and Elizabeth; three sisters, Freda Pluemer, May Kay Muller and Bernetta Hinderman; a brother, Irvin; four brothers-in-law, Floyd Gillen, Philbert Pluemer, Robert Richard and Jerry Jansen; and a granddaughter, Sarah Friederick. She was buried after 30 March 2010 at Immaculate Conception Church Cemetery, Kieler, Grant, Wisconsin. Clifford Muller was born on 3 October 1920 at Wisconsin. He was the son of Phillip Muller and Elizabeth Holzer. Clifford Muller married Marie Winkler on 7 October 1941. Clifford Muller died on 21 August 2012 at age 91 Clifford A. Muller, age 91, of Lancaster, died on Tuesday, Aug. 21, 2012, at Grant Regional Health Center in Lancaster. He was born on Oct. 3, 1920, in Tennyson, the son of Philip and Elizabeth (Holzer) Muller. Clifford attended St. Andrew Catholic School in Tennyson. On Oct. 7, 1941, he was united in marriage to Marie Winkler at St. Andrew Catholic Church in Tennyson. Clifford served his country during World War II and the Normandy Invasion. He went in with the second wave at Omaha Beach. Clifford was honorably discharged in 1945 and was awarded a Good Conduct Ribbon, Purple Heart, American Theater Ribbon, World War II Victory Medal, and a European Theater Ribbon with a bronze star. Clifford was employed with the Grant County Highway Department for 39 years as a heavy equipment operator, retiring in 1982. He was a member of St. Clement Catholic Church where he served as an usher, the Knights of Columbus, the William Pollock VFW Post No. 2344, DAV Chapter 40, and served as a board member for the housing authority at Sunrise Valley Apartments for 15 years. Clifford enjoyed woodworking, going on bus tours, gardening, fixing appliances for family and friends, playing cards at Zippy’s and family gatherings. Survivors include his loving wife of 70 years, Marie Muller of Lancaster; their children, Carol Jean (Fred) Gensmer of Janesville, Thomas (Verna) Muller of Montgomery, Ill., and James (Donna) Muller of Stitzer; three grandchildren, Michael (Katie) Muller of Hanover Park, Ill., Shelly (Roger) Swenson of Oregon, and Phillip Gensmer of Janesville; four great-grandchildren; his sisters, Edna Gillen of Dickeyville, Marcie (Martin) Kieler, Viola (Robert) Necker, Marion Welter, Betty Jansen all of Kieler, Isabel (Robert) Dare, Patricia (Joe) Kaster all of Janesville; his sister-in-law, Clotilda Muller of Kieler; his brothers-in-law, Cecil Hinderman of Dickeyville, and Francis Kieler of Kieler; grandson-in-law, Brian Wheeler of Lee, Ill; and numerous nieces and nephews. In addition to his parents, Clifford was preceded in death by his brother and sisters, Irvin, Mary Kay Muller, Freda Pluemer, Bernetta Hinderman and Margaretta Kieler; two grandchildren, Jeffrey Muller and Cathy Wheeler; and his brothers-in-law, Philbert Pluemer, Jerry Jansen, Floyd Gillen and Robert Richard. Funeral services will be held on Saturday, Aug. 25, 2012, at 10:30 a.m. at ST. CLEMENT CATHOLIC CHURCH in Lancaster with Father William Seipp officiating. Burial with military honors will be in St. Clement Cemetery, Lancaster. Family and friends may call on Friday, Aug. 24, 2012, from 4 p.m. until 7:30 p.m. and on Saturday from 9:30 a.m. until time of services all at the church. Married Name 7 October 1941 As of 7 October 1941,her married name was Muller. Marie Winkler was born before 1923. She married Clifford Muller, son of Phillip Muller and Elizabeth Holzer, on 7 October 1941. Married Name 22 November 1941 As of 22 November 1941,her married name was Gillen. Edna Muller was born on 3 December 1921. Edna Muller married Floyd Gillen on 22 November 1941. Edna Muller died on 6 November 2015 at age 93 Edna C. Gillen, 93, of Dickeyville, WI passed away peacefully, with her loving family at her side, on Friday, November 6, 2015 at Epione Pavilion in Cuba City, WI. Services will be held at 2 p.m. on Tuesday, November 10th at the Immaculate Conception Catholic Church in Kieler, WI with Father Bernie Rott officiating. Burial will be in the Immaculate Conception Church Cemetery in Kieler, WI. Friends may call on 10 a.m. until time of service on Tuesday, November 10th at the Immaculate Conception Parish Center in Kieler, WI. The Haudenshield Funeral Home & Cremation Services in Cuba City, WI is serving the family. Edna was born on December 3, 1921 in Tennyson, WI, daughter of Phillip and Elizabeth (Holzer) Muller. She married Floyd "Cracker" Gillen Sr. on November 22, 1941 in Lancaster, WI. Together Edna and Floyd owned and operated the Sandy Hook Tavern for over 38 years and were members of the Tavern League. She was a member of Immaculate Conception Catholic Church, Kieler, WI, she enjoyed euchre, bowling, was an avid Green Bay Packer fan and an avid supporter of Wisconsin Badger Camp. She enjoyed her time spent with family and friends. She will be greatly missed by all who knew and loved her. Edna is survived by 2 sons: Floyd "Jug" (Pam) Gillen Jr. of Kieler, WI and John (Linda Miatke) Gillen of Dubuque, IA; 4 daughters: Carolyn "Sitsy" Koeller of Kieler, WI, Sandy (Clete) Jerrett of Lancaster, WI, Marlene "Beanie" (Terry) Droessler of Potosi, WI and Vicki (Fiance-Joe Kruser) Haverland of Hazel Green, WI; 16 grandchildren; 27 great grandchildren; 8 great-great grandchildren; 6 sisters: Marcella (Martin) Kieler, Marion Welter, Viola (Bob) Necker, Betty Jansen, Isabel (Bob) Dare, Patricia (Joe) Kaster; 2 sisters-in-law: Marie Muller, Clotilda Muller; 2 brothers-in-law; Francis Kieler, Cecil Hinderman, along with nieces and nephews. She was preceded in death by her parents, husband Floyd (March 17, 2007), a son-in-law, Larry Koeller and a grandson, Jason Gillen & Michael Koeller, brothers; Clifford and Irvin, sisters; Freda (Philbert) Pluemer, Margaretta Kieler, Bernetta Hinderman and Mary Kay Muller, brothers-in-law; Bob Richard and Jerry Jansen. Floyd Gillen married Edna Muller, daughter of Phillip Muller and Elizabeth Holzer, on 22 November 1941. Floyd Gillen died on 17 March 2007. Name Variation Marion Muller was also known as Marian. Married Name 21 June 1951 As of 21 June 1951,her married name was Welter. Marion Muller was born on 18 March 1931. Marion Muller married Harold J. Welter on 21 June 1951. Harold J. Welter was born on 28 May 1929. He married Marion Muller, daughter of Phillip Muller and Elizabeth Holzer, on 21 June 1951. Harold J. Welter died on 2 March 2013 at age 83. Married Name Her married name was Jansen. Betty Muller married Jerry Jansen. Betty Muller was born circa 1934 at Wisconsin. Jerry Jansen married Betty Muller, daughter of Phillip Muller and Elizabeth Holzer. Jerry Jansen died before 2010. Married Name after 1950 As of after 1950,her married name was Dare. Isabel Muller was born circa 1937 at Wisconsin. Isabel Muller married Robert Dare after 1950. Robert Dare married Isabel Muller, daughter of Phillip Muller and Elizabeth Holzer, after 1950. Name Variation Patricia Muller was also known as Patty. Married Name after 1950 As of after 1950,her married name was Kaster. Patricia Muller was the daughter of Phillip Muller and Elizabeth Holzer. Patricia Muller married Joe Kaster after 1950. Joe Kaster married Patricia Muller, daughter of Phillip Muller and Elizabeth Holzer, after 1950. Name Variation May Kay Muller was also known as Kathryn. Name Variation May Kay Muller was also known as Catherine. May Kay Muller was born circa 1939 at Wisconsin. May Kay Muller died before 2010. Married Name 5 May 1954 As of 5 May 1954,her married name was Hinderman. Bernetta Muller was born in 1935. Bernetta Muller married Cecil W. Hinderman, son of Edward J. Hinderman and Katherine Droessler, on 5 May 1954. Bernetta Muller died on 15 March 2001. Cecil W. Hinderman was born on 7 July 1934. He was the son of Edward J. Hinderman and Katherine Droessler. Cecil W. Hinderman married Bernetta Muller, daughter of Phillip Muller and Elizabeth Holzer, on 5 May 1954. Cecil W. Hinderman died on 13 January 2017 at age 82 Cecil W. Hinderman, 82, of Dickeyville, Wisconsin, died Friday, January 13, 2017, at Southwest Health Center Hospital in Platteville. Services will be 10:30 a.m. Wednesday, January 18, 2017, at Holy Ghost Catholic Church in Dickeyville with Rev. Bernard Rott officiating. Burial will be in the church cemetery. Friends may call from 2-8 p.m. Tuesday at Casey Funeral Home & Cremation Services in Cuba City where the parish wake service will be at 1:45 p.m. Friends may also call from 9-9:45 a.m. Wednesday at the funeral home before the service. Cecil was born on July 7, 1934, in Dickeyville, Wisconsin, the son of Edward and Katherine (Droessler) Hinderman. He married Bernetta Muller on May 5, 1954, at Holy Ghost Church in Dickeyville. She preceded him in death on March 15, 2001. Cecil farmed and worked at Kunkel's DeLaval and Mississippi Valley Forest Products until his retirement in 2003. He worked part time at Carquest until his full retirement. Cecil loved going to Katina's for coffee in the morning and Gooch's Greenhouse, Sunset Lanes and Daniel's Lounge for socializing with the guys. In his younger years he and Bernetta enjoyed fishing, square dancing and playing cards in two different card clubs. He was a charter member of the Dickeyville Lions Club. Survivors include his daughters, Lori (David) Schuchart, of Cuba City, Linda (Mike) Kress, of Potosi; his sons, Doug (Connie) Hinderman, of Dubuque, and Gary (Lisa) Hinderman, of Platteville; twelve grandchildren; many extended grandchildren and great-grandchildren; and many brothers-in-law and sisters-in-law. He was also preceded in death by a son, Daniel; a grandson, Bradley Schuchart; his brothers, Dennis, Roland, and Edward Hinderman, and Robert Timmerman Sr; an infant sister, Vera; and many brothers-in-law and sisters-in-law. Irvin John Muller was born on 22 May 1925. Irvin John Muller died on 22 March 1998 at age 72. Married Name Her married name was Haberkorn. Violet (?) married Wiliam Haberkorn. Violet (?) died after 2005. Wiliam Haberkorn married Violet (?). Wiliam Haberkorn died before 2005. Janet Kieler was the daughter of Walter J. Kieler and Agnes L. Mahoney. Janet Kieler died on 3 October 1993. Kevin E. Kieler was born on 27 January 1953 at Dubuque, Iowa. He was the son of Edward Charles Kieler and Berniece Mary Abing. Kevin E. Kieler died on 21 October 1999 at age 46 Kevin E. Kieler , 46, of Long Grove, Iowa, formerly of Dubuque, died Thursday, Oct. 21, 1999, at Genesis Medical Center West Campus, Davenport, Iowa, due to injuries sustained in an accident in Long Grove. Services will be at 11 a.m. Monday at Immaculate Conception Catholic Church, Kieler , Wis. Burial will be in the church cemetery. Friends may call from 7 to 9 p.m. today at St. Ann's Catholic Church, Long Grove, where there will be a vigil service at 7 p.m. Friends may also call from 3 to 8 p.m. Sunday at Casey Funeral Home, Cuba City, Wis., where there will be a wake service at 7:30 p.m. He worked at John Deere Davenport Works for 25 years. He was born on Jan. 27, 1953, in Dubuque. He was a graduate of Wahlert High School. He lived life to the fullest. His greatest love was his daughter and son. He was the type of person who would do anything for anybody. He enjoyed working on all types of John Deere tractors, and with his friends, he rebuilt many of them over the years. He was on the Planning and Zoning Board in Long Grove. He was an avid outdoorsman, and he loved to hunt and fish. Surviving are his daughter, Rachel, of Long Grove; his son, Ben, of Long Grove; his mother, Berniece Kieler Kaiser, of Kieler ; a brother, Dwaine C. (Mary Rose) Kieler , of Oregon, Wis; three sisters, Mary Jo Kieler , of Brookfield, Wis., Sharon Kaiser, of Dickeyville, Wis., and Lori (Dave) Freese, of East Dubuque, Ill; two step-sisters, Joan (Matt) Kieler , of Hazel Green, Wis., and Mary Jo (Dave) Brant, of Kieler ; nine nieces and nephews; and 10 step-nieces and step-nephews. He was preceded in death by his father, Edward C. Kieler . He was buried after 21 October 1999 at Immaculate Conception Church Cemetery, Kieler, Grant, Wisconsin. Name Variation Charles Loeffelholz was also known as Charly. Charles Loeffelholz married Emelia Salzmann. Charles Loeffelholz was born in August 1893 at Wisconsin. He was the son of Michael Loeffelholz and Theresia Dietzel. Charles Loeffelholz died in March 1972 at age 78 Charles Loeffelholz obituary. Emelia Salzmann married Charles Loeffelholz, son of Michael Loeffelholz and Theresia Dietzel. Emelia Salzmann died before 1972. Married Name Her married name was Melssen. Barbara Riemenapp was the daughter of (?) Riemenapp. Barbara Riemenapp married Leo Melssen. Name Variation Charlotte Elnore Kringle was also known as Charlotte A. Married Name 29 September 1956 As of 29 September 1956,her married name was Helbing. Charlotte Elnore Kringle was born on 8 March 1929 at Dubuque, Iowa. She married William Anton Helbing, son of John Christ Helbing and Anna M. Hinderman, on 29 September 1956 at Key West, Iowa, William A Helbing and Charlotte Elnore Kringle marriage announcement. Charlotte Elnore Kringle died on 30 August 2014 at Cuba City, Grant, Wisconsin, at age 85 Charlotte A. Helbing , age 85, of Cuba City, passed away on Saturday, Aug. 30, 2014, at Epione Pavilion in Cuba City. Services will be held at 11 a.m., on Wednesday, Sept. 3, 2014, at the PLATTEVILLE FREE METHODIST CHURCH in Platteville, with Pastor Jeff Suits officiating. Burial will be at St. Francis de Sale Cemetery in Hazel Green. Friends may call from 5 p.m. until 8 p.m. on Tuesday, Sept. 2, 2014, at the HAUDENSHIELD FUNERAL HOME and CREMATION SERVICES in Cuba City, and on Wednesday, Sept. 3, 2014, from 10 a.m. until the time of the service at the church. Married Name November 1972 As of November 1972,her married name was Runde. Diane Helbing was born before 1954. She was the daughter of Edward H. Helbing and Leora Mary Jansen. Married Name 17 October 1944 As of 17 October 1944,her married name was Splinter. Roselin Jansen was born on 25 August 1924 at Wisconsin. She was the daughter of Frank Mathias Jansen and Ida Dora Montag. Roselin Jansen married LaVern Splinter on 17 October 1944. Roselin Jansen died on 29 May 2017 at Cuba City, Grant, Wisconsin, at age 92 Roselin C. Splinter, 92, formerly of Dickeyville, Wisconsin, died Monday, May 29, 2017, at Epione Pavilion in Cuba City. Services will be 10:30 a.m. Thursday, June 1, 2017, at Holy Ghost Catholic Church in Dickeyville with Rev. Bernard Rott officiating. Burial will be in the church cemetery. Friends may call from 3-7 p.m. Wednesday at Casey Funeral Home & Cremation Services in Cuba City where the parish wake service will be at 2:45 p.m. Friends may also call 8:45-9:30 a.m. Thursday at the funeral home before the service. Roselin was born on August 25, 1924, in Grant County, Wisconsin, the daughter of Frank and Ida (Montag) Jansen. She married LaVern J. Splinter on October 17, 1944, in Kieler. He preceded her in death on February 16, 2009. Roselin was a hard working farm wife, mother and homemaker. She did all the cooking, baking and sewing for the family. In her spare time, she enjoyed crocheting, reading and doing crossword puzzles. She had a very religious orientation with a special devotion to Mary. Together Roselin and LaVern raised eight children. She lived for her family and sacrificed much for her family. Roselin is survived by five daughters and three sons, Carol Weland, of Dubuque, Jane and Mary Splinter, of Platteville, Rita (Gary) Hingtgen, of Kieler, Donna (Tom) Covert, of Platteville, LaVern Splinter Jr., of Platteville, David (Diane) Splinter, of Dickeyville, and Ken (Cathy) Splinter, of Platteville. She is also survived by a brother, Paul F. (Alice Charpentier) Jansen, of Lewiston, Idaho; six grandchildren; ten great-grandchildren; four great-great-grandchildren; and many nieces and nephews. She was also preceded in death by her parents; two sisters, Marie (Walter) Hinderman and Leora (Ed) Helbing; a brother, Eldon (Marge) Jansen; her in-laws, Irenus and Caroline (Kruser) Splinter; a son-in-law, Robert Weland; a grandson, Jesse Splinter; and several sisters-in-law and brothers-in-law. LaVern Splinter was born on 30 May 1919 at Dickeyville, Grant, Wisconsin. He married Roselin Jansen, daughter of Frank Mathias Jansen and Ida Dora Montag, on 17 October 1944. LaVern Splinter died on 16 February 2009 at age 89. Mark Helbing was born on 5 November 1964 at Cuba City, Grant, Wisconsin. He was the son of Edward H. Helbing and Leora Mary Jansen. Mark Helbing died in March 1972 at age 7 Mark Helbing, age 7, obituary. Eldon Frank Jansen was born on 15 October 1933 at Wisconsin. He was the son of Frank Mathias Jansen and Ida Dora Montag. Eldon Frank Jansen died on 27 February 1988 at Josephine, Oregon, at age 54.